Healthy Pulled Pork? That’s an oxymoron, right? 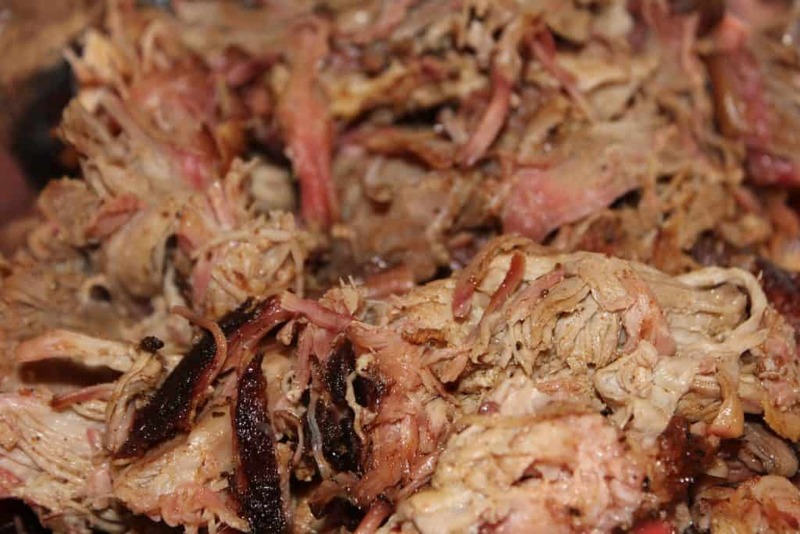 When most people think of pulled pork they think of a delicious pork shoulder, cooked low and slow on a smoker or a (GASP) crockpot, and then drenched in Tangy Sweet BBQ sauce and maybe even a little Dr. Pepper. Delicious? Yes. Healthy and keto friendly? No. 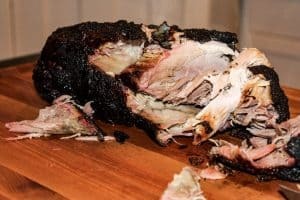 One of the reasons we enjoy our smoker so much is because we can cook a big hunk of meat on Sunday, invite our friends and family over to enjoy dinner, and then we have “HEALTHY” leftovers for lunches the rest of the week. Most of the time we don’t include sugar in our rubs, and if we smoke a pork shoulder or chuck roast, we leave the sauce on the side to be added at each dinner guests discretion. Everyone has their own idea of what a healthy diet is. My wife follows a version of the ketogenic diet 7 days per week. I follow a similar plan, but I include a weekly cheat day (Smoked Meat Sunday!). Most of our meals include heaping amounts of vegetables and a protein. Very few of our meals include starchy carbs like bread, rice, or pasta. Again, Sundays are the exception for me. We respect everyone’s choice when it comes to food, so we won’t push the perceived health benefits of our diet on you, but we will share the recipes we use to help us stay on track and still eat delicious food. This week’s meal was keto friendly Pulled Pork. 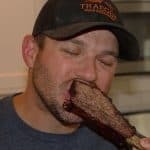 One of the struggles I had when I first bought my smoker, was getting a better understanding of how long a meal would take to smoke on my Traeger. It’s only fair that my wife and friends wanted to know when dinner would be, and far too often the time I gave them would be WAY off. Over time I started to get a better understanding of how long it would take to cook different meals on my smoker. If you’re like me, you are probably wondering, what is the cook time for pork shoulder? The best rule of thumb I’ve come across is to keep smoking times per pound at about 90 minutes. Of course, this is just a general guideline. Sometimes it takes a little longer, but that is ok! The biggest key is to keep an eye on the internal temperature. When we are cooking a pork shoulder, we want the internal temperature to get up to 203 degrees. The easiest way to check the internal temp is by using a good quality meat thermometer. I use a Thermapen Mk4 and I love it. 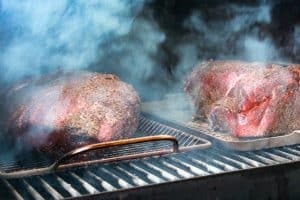 I also use the Thermoworks Smoke to monitor the temp of my smoker, and of the meat inside the smoker, while I’m doing other chores around the house. One last note on cooking times. Always start your cook early. 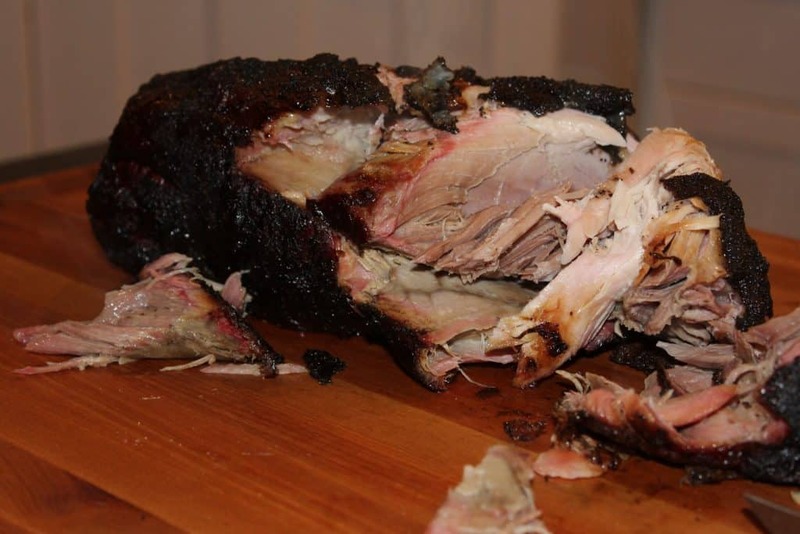 If you have a 7-pound pork shoulder, it should take about ten and a half hours to smoke on your pellet grill. If dinner is supposed to be at 5, start your cook at 4:30 in the morning. You might finish early, but that is ok! 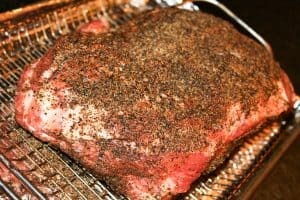 One of the biggest keys to delicious and moist pulled pork is making sure your meat has adequate time to rest. When your pork shoulder has hit the magic temp of 203, pull the pork shoulder off the smoker and double wrap it with aluminum foil. I place the wrapped pork shoulder on a pan, and then place it in my cooler, and put towels on top of it. This will allow the pork shoulder to slowly come down in temperature, and the juices in the meat will redistribute evenly. You can let a wrapped pork shoulder sit in a sealed cooler for up to two hours and have absolutely no issues. Another great reason to invest in the Thermoworks Smoke. You can monitor your meat while it’s resting. I’ve let pork shoulders rest in a good cooler for up to 4 hours and had no issues at all. I always let my pork shoulders rest for at least an hour. I’ve made the mistake of not letting my pork shoulders rest, and it has always resulted in very dry shredded meat. 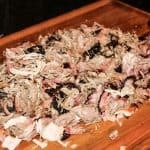 My favorite healthy and keto friendly pulled pork recipe can be found below. 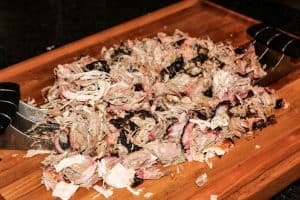 There are a lot of different ways to make pulled pork, and I’d love to hear what you do differently when you make pulled pork. Leave a note in the comments below. You don't need to drench your pulled pork in sauce and sugars to make it taste good! 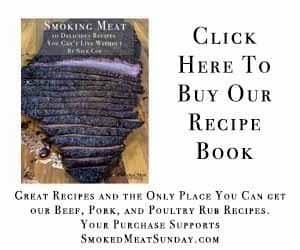 Our family loves this Simple and Healthy Smoked Pulled Pork recipe and we are sure your family will love it too! Following the keto diet? 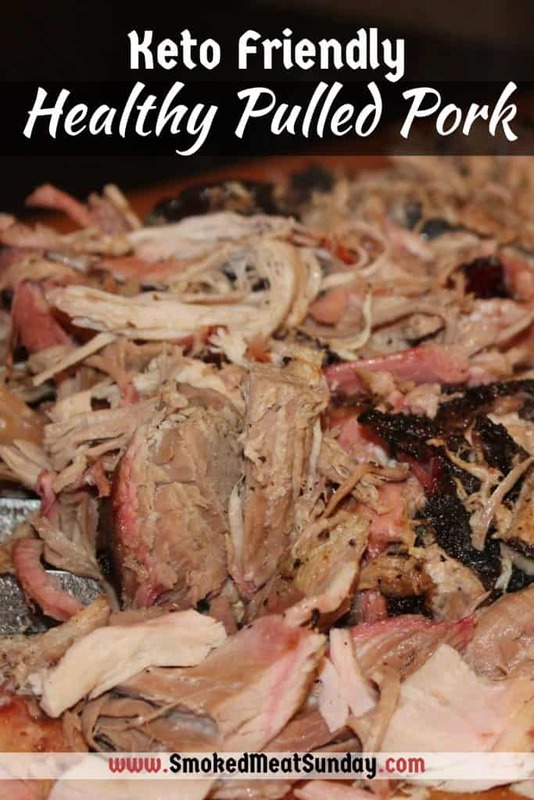 This pulled pork recipe is sugar free! It doesn't take long to prep your meat for this cook, so before you do anything, I'd get your smoker up to temp. We want to start out at 225 degrees. Place your pork shoulder on a cutting board, fat cap up. With a sharp knife, score the fat cap in a one-inch checkerboard pattern. This will allow the rub to penetrate down into the meat on all sides. Cover the entire cut of meat with your garlic infused olive oil, and then generously apply your rub on all sides. Be sure to really massage the rub into any folds in the meat, you want as much delicious bark as possible! Place the pork shoulder on the smoker, which should be at 225 degrees. After 2 hours, increase the temp on your smoker to 250, and generously spray your pork shoulder. Continue spraying at the top of each hour, but otherwise, leave the door on your smoker closed! Every cut of meat is different, but it typically takes about 90 minutes per pound to get your meat up to the magic temp of 200-203 degrees. Once you're there, pull the pork shoulder from the smoker, double wrap it in foil, and place it in a cooler with some towels. Let the shoulder rest in your cooler for 90-120 minutes. This will allow the juices in the meat to redisburse, giving you some AWESOME flavor. Be sure to remove the shoulder blade, and discard any large chunks of fat or bone you come across while you are shredding. This healthy pulled pork is delicious on a salad, on a bun, or even on nachos! We went a little crazy this week and made a cheese sauce alongside the pork. 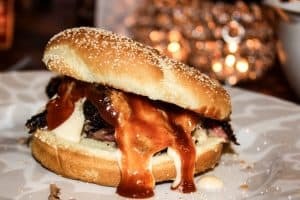 Our guests drizzled the cheese sauce on the kaiser roll, followed by some pulled pork, then more cheese sauce, and some BBQ sauce. Maybe not the healthiest way to eat this pulled pork… but pulled pork can be healthy, and it is certainly delicious.